As we wrap up our month of Spring Cleaning, I wanted to finish by talking about something that is very important to me. When talking about the harmful chemicals that we use around us, many times we forget that what we use outside on our lawns and in our gardens, can have a HUGE effect on the environment and on the insects and animals that are around us. A few months ago I began to notice how many dead bees I would see on a daily basis. Every day on my walk I would find at least 1-3 dead bees outside before I had even gotten 20 feet from my door. Then one day I noticed literally hundreds of bees lying dead in an area just 15-20 feet from my front door … it made me so sad. To this day, I have no idea what happened, but it has made me even more aware of the pesticides, insecticides and herbicides that are used outside. Pesticides are harming our families, pets, the animals outside and are creating huge issues in our world. This is a big deal with massive ramifications! Studies show that even low levels of exposure to lawn pesticide products are linked to increased rates of miscarriage, and suppression of the nervous, endocrine, and immune systems. Of 30 commonly used lawn pesticides 19 have studies pointing toward carcinogens, 13 are linked with birth defects, 21 with reproductive effects, 15 with neurotoxicity, 26 with liver or kidney damage, 27 are sensitizers and/or irritants, and 11 have the potential to disrupt the endocrine (hormonal) system. One year ago, Environmental Protection Agency Administrator Scott Pruitt sided with the pesticide lobby over EPA scientists in an eleventh-hour decision to abort the agency’s proposal to ban chlorpyrifos from use on food crops. Chlorpyrifos is an insecticide that can harm children’s brains and nervous systems at small doses. If Pruitt had stood by his own scientists, the chlorpyrifos ban could have taken practical effect next year, but now the EPA won’t reevaluate its safety until 2022. Based on data from the U.S. Geological Survey, the delay means roughly 30 million pounds of the weed-killer will be sprayed on cropland throughout the country in the next five years. The evidence is overwhelming that even small doses of chlorpyrifos can damage parts of the brain that control language, memory, behavior and emotion. Multiple independent studies have documented that exposure to chlorpyrifos impairs children’s IQs. EPA scientists’ assessments of those studies concluded that levels of the pesticide currently found on food and in drinking water are unsafe. I could write pages and pages about pesticides, herbicides, insecticides … really all of the “cides”. Again, this can seem like such an overwhelming issue, one that we can do nothing about, but we can start with what we do have control over. Here are some ideas that you can use in your home gardens and landscaping. 1) Instead of fertilizers try cover crops or locally available bulk organic compost to provide nutrients to your soil. 2) Mulching is adding a protective covering, usually of organic matter such as leaves, straw, compost, or peat, placed around plants. Mulching has multiple benefits including enriching the soil, preventing erosion, freezing of roots, moisture from evaporating, and the growth of weeds. systemic, which means they are absorbed by the plant tissues and expressed in all parts, including nectar and pollen. Unfortunately, bees, butterflies, and other flower-visiting insects are harmed by the residues. 1) Buy plants and flowers that are free from neonicotinoids. If you see one of the following names listed, the insecticide includes a neonicotinoid: acetamiprid, clothianidin, dinotefuran, imidacloprid, nitenpyram, thiocloprid, thiamethoxam. 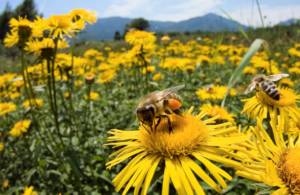 with neonicotinoids, and encouraging your city or park district to use alternatives to neonicotinoids on plants that are visited by bees or that are bee-pollinated. 1) Vote with your money. Only buy organic produce, even if it is not a part of the dirty dozen! Support farms who are certified organic and don’t support those who are not. Protect yourself and your family from the harmful chemicals that are on your non-organic foods. 2) Wash fruits and vegetables before eating. Commercial vegetable and fruit washes are available which are formulated to remove chemical residue from produce. For grapes, strawberries, green beans, and leafy vegetables, swirl the foods in a mixture of wash and water at room temperature for 5 to 10 seconds, then rinse with slightly warm water. For other fruits and vegetables, use a soft brush to scrub the food with the solution for about 5 to 10 seconds, then rinse with slightly warm water. 3) Have a ‘no shoes’ policy in your home. When visitors to your home walk across a lawn that has been treated with chemical fertilizers and herbicides, residue from these chemicals may be tracked into your home. In some instances, these residues may last for years in carpeting and on floor surfaces. The simple practice of leaving shoes at the door will minimize this risk and reduce your home cleaning chores. You can provide inexpensive house slippers for guests who are unused to going shoeless indoors. 4) Find organizations who are already campaigning against the use of pesticides and other harmful chemicals and join them in their fight. We hope that you have been inspired this month to become more educated about what is around you in your homes and outside your door. To your health and the health of our planet, with love.